Real-time waveform server implementing the SeedLink protocol. SeedLink is a real-time data acquisition protocol and a client-server software that implements this protocol. The SeedLink protocol is based on TCP. All connections are initiated by the client. During handshaking phase the client can subscribe to specific stations and streams using simple commands in ASCII coding. When handshaking is completed, a stream of SeedLink "packets" consisting of a 8-byte SeedLink header (containing the sequence number) followed by a 512-byte Mini-SEED record, is sent to the client. The packets of each individual station are always transferred in timely (FIFO) order. The SeedLink implementation used in SeisComP is the oldest and most widely used, however, other implementations exist. Another well-known implementation is deployed in IRIS DMC and some manufacturers have implemented SeedLink in their digitizer firmware. All implementations are generally compatible, but not all of them support the full SeedLink protocol. On the other hand IRIS DMC implements some extensions which are not supported by other servers. In the following we use "SeedLink" to denote the SeedLink implementation used in SeisComP. The data source of a SeedLink server can be anything which is supported by a SeedLink plugin - a small program that sends data to the SeedLink server. Plugins are controlled by the SeedLink server, e.g., a plugin is automatically restarted if it crashes or a timeout occurs. Data supplied by a plugin can be a form of Mini-SEED packets or just raw integer samples with accompanying timing information. In the latter case, the SeedLink server uses an inegrated "Stream Processor" to create the desired data streams and assemble Mini-SEED packets. Table 5-1 lists digitizers and data acquisition systems that are supported by SeedLink plugins. More plugins (Kinemetrics K2, Lennartz MARS-88, Lennartz PCM 5800, etc.) have been implemented by various users, but are not (yet) included in the package. The included C language plugin interface is described in section 5.1.1.5. Antelope, Earthworm and NAQS can also import data from SeisComP. In SeisComP the class RecordStream is implemented that supports both SeedLink and ArcLink sources; this class is used by all SeisComP modules that work with waveform data. On a lower level, SeedLink clients can be implemented using the libslink software library or its Java counterpart, JSeedLink. Libslink supports Linux/UNIX, Windows and MacOS X platforms, and comes with an exhaustive documentation in form of UNIX manual pages. We will take a closer look at the protocol. Note, the details are normally hidden from the clients by the libslink software library; therefore it is not necessary to be familiar with the protocol in order to implement clients. When the TCP/IP connection has been established the server will wait for the client to start handshaking without initially sending any data to the client. During handshaking the client sends SeedLink commands to the server. The commands are used to set the connection into a particular mode, setup stream selectors, request a packet sequence number to start with and eventually start data transmission. SeedLink commands consist of an ASCII string followed by zero or several arguments separated by spaces and terminated with carriage return (<cr>, ASCII code 13) followed by an optional linefeed (<lf>, ASCII code 10). The commands can be divided into two categories: "action commands" and "modifier commands". Action commands perform a function such as starting data transfer. Modifier commands are used to specialize or modify the function performed by the action commands that follow. When a server receives a modifier command it responds with the ASCII string "OK" followed by a carriage return and a line feed to acknowledge that the command has been accepted. If the command was not recognized by the server or has invalid parameters, then the ASCII string "ERROR" is sent as a response to the client followed by a carriage return and a line feed. The client should not send any further commands before it has received a response to the previous modifier command. If a network error or timeout occurs the client should close the connection and start a new session. Data transmission is started when the server receives the commands DATA, FETCH, TIME or END as described in section 5.1.1.3. Once the data transfer has been started no more commands, except INFO, should be sent to the server. 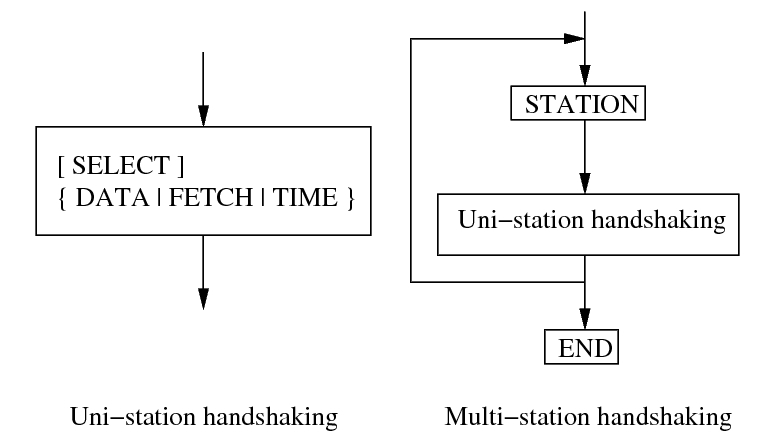 The flow diagram of handshaking in uni-station vs. multi-station mode is shown in Handshaking in uni-station vs. multi-station mode..
Handshaking in uni-station vs. multi-station mode. When handshaking has been completed the server starts sending data packets, each consisting of an 8-byte SeedLink header followed by a 512-byte Mini-SEED record. The SeedLink header is an ASCII string consisting of the letters "SL" followed by a six-digit hexadecimal packet sequence number. Each station has its own sequence numbers. If multiple stations are requested using a single TCP channel the client should look at the contents of the Mini-SEED header to determine the station name (or to maintain the current sequence numbers for each station). A sequence number in the same format is used as an argument to the commands "DATA" or "FETCH" to start the data transfer from a particular packet. Each SeedLink node re-assigns sequence numbers for technical reasons. It is not possible to use the same sequence numbers when communicating with alternative servers. Within a particular node the sequence numbers of a single station are consecutive and wrap around at FFFFFF. This can be used by the client to detect "sequence gaps" (e.g., some data has been missed by the client due to long network outage or a software bug). However, if stream selectors are used the sequence numbers are only guaranteed to be in increasing order (with wrap) because some packets might be filtered out by the server. In this case the first packet is not necessarily the one requested, but the nearest packet (not older than requested) that matches installed selectors. The data is transferred as a continuous stream without any error detections or flow control because these functions are performed by the TCP protocol. This guarantees the highest data transfer rate that is possible with the particular hardware and TCP/IP implementation. Obviously, the average data transfer rate must be greater than the rate at which new data becomes ready to send at the server. If this is the case, sooner or later the server has sent all data available to the client. When this happens, depending on the SeedLink mode, the server sends new data as soon as it arrives or appends ASCII string "END" to the last packet and waits for the client to close connection. The latter mode is called "dial-up mode" because it is normally used in conjunction with dial-up lines to open the connection periodically for a short time and download all data available. A SeedLink packet can never start with "END" thus no ambiguity arises. responds with a two-line message (both lines terminated with <cr><lf>). The first line contains the version number of the SeedLink daemon, the second line contains station or data center description specified in the configuration. HELLO is used mainly for testing a SeedLink server with "telnet". It is also used by libslink to determine the server version. shows the station list. Used mainly for testing a SeedLink server with "telnet". closes the connection. Used mainly for testing a SeedLink server with "telnet". turns on multi-station mode, used to transfer data of multiple stations over a single TCP channel. The STATION command, followed by SELECT (optional) and FETCH, DATA or TIME commands is repeated for each station and the handshaking is finished with END. STATION is a modifier command (it modifies the function of subsequent SELECT, and DATA, FETCH or TIME commands) so it responds with "OK" on success, "ERROR" otherwise. end of handshaking in multi-station mode. This is an action command, because it starts data transfer. No explicit response is sent. when used without pattern, all selectors are canceled. Otherwise, the pattern is a positive selector to enable matching Mini-SEED stream transfer. The pattern can be used as well as a negative selector with a leading "!" to prevent the transfer of some Mini-SEED streams. Only one selector can be used in a single SELECT request. A SeedLink packet is sent to the client if it matches any positive selector and doesn’t match any negative selectors. General format of selectors is LLCCC.T where LL is location, CCC is channel, and T is type (one of DECOTL for data, event, calibration, blockette, timing, and log records). "LL", ".T", and "LLCCC." can be omitted, meaning "any". It is also possible to use "?" in place of L and C. Some examples can be found in table 3-1 in section 3.3.3.2. SELECT is a modifier command (it modifies the function of subsequent DATA, FETCH or TIME commands) so a response follows with "OK" on success, "ERROR" otherwise. in multi-station mode this sets the current station into real-time mode and (optionally) the current sequence number to n; in uni-station mode this starts data transfer in real-time mode from packet n or from the next packet available if used without arguments. If begin time is used, any older packets are filtered out. begin time should be in the form of 6 decimal numbers separated by commas in the form: year,month,day,hour,minute,second, e.g. ’2002,08,05,14,00’. DATA is a modifier command in multi-station mode (responds with "OK" or "ERROR"); in uni-station mode it is an action command (no explicit response is sent). works like DATA but sets the station to dial-up mode instead of real-time mode. extracts the time window from begin time to end time. The times are specified in the form of 6 decimal numbers separated by commas in the form: year,month,day,hour,minute,second, e.g. ’2002,08,05,14,00’. requests an INFO packet containing XML data embedded in a Mini-SEED log record. level should be one of the following: ID, CAPABILITIES, STATIONS, STREAMS, GAPS, CONNECTIONS, ALL. The XML document conforms to the Document Type Definition (DTD) shown in section ???. The amount of info available depends on the configuration of the SeedLink server. time of the first sample in the array. If NULL then time is calculated relative to the previous send_raw3() call. struct ptime is defined in plugin.h. time correction in microseconds to be written in the SEED data header. Can be useful if the digitizer is not phase locked to GPS. timing quality in percent (0-100). The number is directly written into Mini-SEED header (blockette 1001). Semantics is implementation-defined. Usually 100 means that GPS is in lock and 0 means there never was a GPS lock, so the timing is completely unreliable. When GPS goes out of lock, the value can slowly decrease reflecting a possible timedrift. Array of signed 32-bit samples. Length of the sample array. if timing_quality = -1, blockette 1001 is omitted. if number_of_samples = 0 & pt = NULL set new time without sending any data. if dataptr = NULL send a gap (advance time as if number of samples was sent without sending any actual data). same as send_raw3() except time is measured in seconds since 1/1/1970 (depoch). Leap seconds are ignored. pointer to 512-byte Mini-SEED packet. format string, as used by printf(), followed by a variable number of arguments. It is possible to determine the version of the plugin interface by looking at the C macro PLUGIN_INTERFACE_VERSION. The current version is 3, therefore all functions that have changed since earlier versions end with "3". It is possible to enable full backward compatibility with earlier versions of the plugin interface by defining the C macro PLUGIN_COMPATIBILITY. In this case the old functions are also defined. The following configuration files are used by SeedLink and its plugins. Some files such as seedlink.ini, plugin.ini and chain*.xml are generated by the seiscomp tool according to the configuration in etc/seedlink.cfg and its bindings. They live in var/lib/seedlink and should not be modified. If modifications are necessary then the generator needs to be changed to better support the desired user options. Configuration file for SeedLink plugins. Used by serial_plugin, fs_plugin and comserv_plugin. Main configuration file for SeedLink. For more details see below. Coefficients of SeedLink’s decimating FIR filters. If a filter’s name ends with "M", it is a minimum-phase filter – causal filter with minimized (non-constant) phase delay; since the filter is non-symmetric all coefficients must be given. Otherwise the filter is a zero-phase filter, i.e. a non-causal filter with zero phase delay; in this case the filter is symmetric and so only half of the coefficients must be given (it is not possible to use a zero-phase filter with an odd number of coefficients). The coefficients for non-symmetric (minimum-phase) FIR filters in the filters.fir file are stored in reverse order. It is important to reverse the order of coefficients if the operator adds a new minimum-phase filter or uses the included minimum-phase filters for another application. The coefficients for symmetric (zero-phase) FIR filters are not stored in reverse order. As a sanity check for symmetric filters the largest coefficient is always in the middle of the symmetry. SeedLink stream configuration file for the internal stream processor, referenced from seedlink.ini. For details see below. *.ini files have a somewhat obscure syntax. They contain zero or more sections, each beginning with a section name in squared brackets which should appear on a line of its own. Section name cannot contain spaces and squared brackets, but it can be optionally surrounded by spaces. Each section consists of zero or more entries – definitions and assignments. A definition consists of a keyword and a name separated by spaces (e.g. "station EDD"). An assignment consists of a parameter and a value separated by the "=" sign and optionally surrounded by spaces (e.g. "network = GE"). The set of assignments that immediately follow a definition is in the scope of that definition. Assignments in the beginning of a section are "global" – they are used to set some generic parameters and provide default values (e.g. "network = GE" in the beginning of the section sets the default network that can be overridden in the scope of a station definition). Parameters and keywords are case insensitive and must not contain the symbols "=", "[", "]" or spaces. Names must not contain "=" signs or spaces. Values must not contain "=" signs or spaces, unless enclosed in double quotes. Double quotes that are part of the value itself must be preceded by "". Each assignment must be complete on a single line, but several assignments can appear on one line, separated by spaces. Any line beginning with a "#" or "*" character is regarded as a comment and ignored. seedlink.ini is generated from ~/.seiscomp3/seedlink.cfg and etc/seedlink.cfg. root element, has no attributes. defines a "proc" object (set of "stream trees"), referenced from seedlink.ini. name of "proc" object, for reference. used to include all "stream trees" defined by one "proc" object in another "proc" object. the name of referenced "proc" object. defines a "stream tree" – a downsampling scheme of an input channel. associates an input channel with the stream tree. name of the input channel; depends on the configuration of the particular plugin (usual channel names are "Z", "N" and "E"). name of the output channel (last letter of a Mini-SEED stream name). Mini-SEED location code of the output channel (up to two characters). sampling rate of the input channel (must match the actual sampling rate, which is dependent on the configuration of the plugin and digitizer). defines a node of a stream tree; this element is recursive, meaning that it may contain one or more "node" elements itself. use the named filter for decimation; filters are defined in file filters.fir. create Mini-SEED output stream at this node. The value of the attribute should be a Mini-SEED stream name without the last character (which is taken from the attribute "channel" of element "input"). streams.xml is generated into var/lib/seedlink/streams.xml. Each data plugin provides templates with predefined procs. If e.g. the chain plugin is configured with proc stream100 then share/templates/seedlink/chain/streams_stream100.tpl is being read and generated into the final streams.xml. Own proc definitions can be added by creation a corresponding template file. Again, the source and proc definition is used to resolve the streams proc template file at share/templates/seedlink/[source]/streams_[proc].tpl. seedlink is a standalone module and does not inherit global options. Defines the Seedlink port to accept requests. If this port is changed and other modules depend on it (slarchive, processing) those ports must be updated as well! Default is 18000. Path to the base directory of SeedLink data files (disk buffer). Default network code. Used when a network code is omitted by a client in STATION request. Should be set to the network code of the majority of configured stations. 1 or 2 characters long, uppercase. List of trusted addresses. Default is 127.0.0.0/8. Check start and end times of streams. Default is true. If stream_check = enabled, also check for gaps in all channels that match given pattern. Register all gaps that are larger than +-0.5 seconds. gap_check_pattern = [EBLV][HLNG][ZNE]|S[NG][ZNE]. Disabled to save memory. Default is XXXXX. Time difference between records (microseconds) above which a gap is declared. Default is 500000. Can be enabled or disabled. Required for slinktool option -tw. Default is true. Same as window_extraction for trusted IP addresses. Default is true. If activated Seedlink uses the mseedfifo to read records and only the mseedfifo_plugin is started. This command is useful to playback historic data by eg msrtsimul. Default is false. Defines a database read connection to be used for Seedlink station descriptions. If no database is to be used (the default; configure with "") then the station code will be used. Example: "mysql://sysop:sysop@localhost/seiscomp3". If a remote host is specified, ensure that its database server is reachable from this computer. Info level provided to arbitrary hosts. Default is streams. Info level provided to trusted hosts. Default is all. Whether requests should be logged. Default is true. Give warning if an input channel has time gap larger than this (microseconds). Default is 10. Flush streams if an input channel has time gap larger than this (microseconds). Default is 100000. Reset FIR filters if an input channel has time gap larger than this (microseconds). Default is 1000000. Enable backfilling buffer for out-of-order records. This values defines its capacity in seconds. Default is 0. Maximum allowed deviation from the sequence number of oldest packet if packet with requested sequence number is not found. If seq_gap_limit is exceeded, data flow starts from the next packet coming in, otherwise from the oldest packet in buffer. Default is 100000. Total number of TCP/IP connections allowed. Default is 500. Maximum number of TCP/IP connections per IP. Default is 20. Maximum speed per connection (0: throttle disabled). Default is 0. Path to lockfile to prevent multiple instances. Default is @ROOTDIR@/var/run/seedlink.pid. Size of memory buffer (number of recent Mini-SEED records kept in RAM). Default is 100. Number of disk buffer segments (files under <dir>/station/segments/ where <dir> is the directory given by the filebase parameter). Default is 50. Size of one disk buffer segment in the records (512-byte units). Default is 1000. Number of blank records to insert after the re-scan of disk buffer if <dir>/station/buffer.xml is not found (assuming the server did not terminate correctly). Default is 10. Encoding of Mini-SEED records created by SeedLink. The value must be steim1 or steim2. If omitted, the global encoding parameter is used. Default is steim2. If configured with a value greater than zero then all sequence files created by the chain plugin are deleted which are older than X minutes before Seedlink is started. Default is 0. Defines the maximum number of concurrent dial-up connections. A value of 0 does not limit the concurrent connections. Default is 0. If enabled load_timetable is used by the chain plugin to request the available time windows of each stream in the Seedlink buffer to discard older records. Default is true. UDP base port used when udp port is defined as "auto" Default is 5500. List of IP addresses or IP/mask pairs (in ipchains/iptables syntax). Only if a client's IP address matches one of those the station is shown (slinktool -L, etc.) and accessible. If omitted, the global access parameter is used. If the global access parameter is not set any client can access the station. Default is 0.0.0.0/0. Encoding of Mini-SEED records created by SeedLink. The value must be steim1 or steim2. If omitted, the global encoding parameter is used. Enable backfilling buffer for out-of-order records when raw samples are transmitted. This values defines its capacity in seconds. Default is 0. Defines a list of extension bindings to be used. Each binding can then be configured individually. # param1 and param2 are just placeholders. # To use the same binding twice, aliases must be used. Hostname or IP of the Seedlink server. Default is geofon.gfz-potsdam.de. Port of the Seedlink server Default is 18000. List of stream selectors. If left empty all available streams will be requested. See slinktool manpage for more information. Name of the proc object (defined in streams.xml); used for processing raw streams (streams submitted by a plugin as raw samples). Defines the input station if different from the stations code. Usually leave this parameter unconfigured. If configured and different from the stations code the station code will be renamed to match the local station code. Defines the input network if different from the stations network. Usually leave this parameter unconfigured. If configured and different from the stations network code the network code will be renamed to match the local network code. Usually stations with the same source addresses and dialup options are grouped together and managed by a chain plugin process. You can give here an additional group ID. Available placeholders are $NET and $STA that are replaced by the network code or station code. Whitespaces are replaced by underscores when generating chain.xml. The default timing quality is used when unpacking data that does not contain blockette 1001, that allows SeedLink to construct blockette 1001 for downsampled data. If overlap removal is set to "initial" or "full", then earlier records will be discarded (record number is used in case several subsequent records have the same header time). All other values are treated as "none". Leave this option unset unless you know what you are doing. If enabled then the chain plugin tries to subscribe for channels with the BATCH command which is magnitudes faster than the old handshake. Not all SeedLink servers support the BATCH mode so it needs to be turned off in case of problems. Default is true. Enables dialup mode. Needs schedule and uptime to be set accordingly. Default is false. Dialup uptime in seconds. Default is 600. The dialup schedula in cron format. Default is 0,30 * * * *. An optional dialup ifup script. An optional dialup ifdown script. Allows to rename channels. This is a list of strings where each item defines one mapping in the format "SRC_LOCCHA:DST_LOCCHA". Either SRC_LOCCHA or DST_LOCCHA may contain wildcard characters (question mark) and the location code (LOC) in both identifiers is optional. Allows to unpack channels instead of sending them as miniseed to Seedlink. Unpacked streams can be downsampled by Seedlink. This is a list of strings where each item defines one unpack mapping in the format "SRC_LOCCHA:DST_ID:1" where DST_ID can be an arbitrary channel id which must match the definition of a stream in streams.xml. The last ":1" is optional and defines if the unpacked data should be doubled (duplicate each sample). In case rename mappings are active, SRC_LOCCHA referes to the final channel name after renaming. Serial port. Default is /dev/data. Baud rate. Default is 19200. Name of the proc object (defined in streams.xml); used for processing raw streams (streams submitted by a plugin as raw samples). Default is dm24_20. Name of the proc object (defined in streams.xml); used for processing raw streams (streams submitted by a plugin as raw samples). Default is dr24_20. Baud rate. Default is 115200. Name of the proc object (defined in streams.xml); used for processing raw streams (streams submitted by a plugin as raw samples). Default is edata_100. Hostname or IP of the Earthworm export server. Port of the Earthworm export server. Text for heartbeat to server. Default is alive. Rate at which to expect heartbeats from server in seconds. Default is 120. Bind IP of the Earthworm passive export server. Port of the Earthworm passive export server. "pattern" is a POSIX extended regular expression that must match input file names (useful for filtering out non-data files). For example "BH[NEZ]" would match any files that contained "BHE", "BHN" or "BHZ". If no pattern is specified all files will be processed. Look for data files at the 1st or 2nd directory level. Default is 2. Move file to subdirectory "processed" before starting to read it. Default is true. Delete processed files. Default is false. Look only for files that are newer than the last file processed. Default is false. Timestamp file is used to save the modification time of the last file processed. Default is @ROOTDIR@/var/run/seedlink/fs_mseed.tim. New files are searched for every "polltime" seconds. Default is 10. Wait until the file is at least n seconds old, before trying to read it. Default is 30. Tells how many debugging messages are printed. Default is 1. Maximum number of consecutive zeros in datastream before data gap will be declared (-1 = disabled). Default is 10. If timing quality is not available, use this value as default (-1 = disabled). Default is -1. sources.fs_mseed.channels. * Channel definitions (Mini-SEED streams are defined in streams.xml, look for <proc name="generic_3x50">). sources.fs_mseed.channels.$name. * $name is a placeholder for the name to be used. Number of bundles in packet. Default is 59. Name of the proc object (defined in streams.xml); used for processing raw streams (streams submitted by a plugin as raw samples). Default is hrd24_100. Hostname or IP of the LISS server. Default is "$STATION.$NET.liss.org". Port of the LISS server Default is 4000. Time offset in usecs. Default is 0. Name of the proc object (defined in streams.xml); used for processing raw streams (streams submitted by a plugin as raw samples). Default is m24_100. Device path and name of port for USB Seismometer Interface. If the specified port cannot be opened or is not a USB Seismometer Interface device, all available ports will be scanned. Default is /dev/ttyACM0. Allow low-level setting of port interface attributes when available ports are scanned to find a USB Seismometer Interface device, 0=NO, 1=Yes. Setting 1 (=Yes) may help successful detection and correct reading of the USB Seismometer Interface device, particularly for the RasberryPi, but can have adverse effects on other devices, terminals, etc. open on the system. Default is 1. Sets a fixed sample rate to report in the miniseed file header. The default (-1) sets an estimated sample rate based on recent packet start times. This estimated sample rate will vary slightly over time, potentially producing errors in some software when reading the miniseed files. See also: nominal_sample_rate Default is -1. SEED data encoding type for writing miniseed files. Supported values are: INT16, INT32, STEIM1, STEIM2 Default is STEIM2. The initial letters to set for the miniseed header 'channel', will be prepended to the component. Default is SH. Component of seismogram, one of Z, N or E. Default is Z. Set sample rate and gain on SEP 064 device, 0=NO, 1=Yes. Default is 1. Nominal sample rate per second, one of 20, 40 or 80. Default is 80. Nominal gain, one of 1, 2 or 4. Default is 4. Serial port. Default is /dev/weatherstation. Name of the proc object (defined in streams.xml); used for processing raw streams (streams submitted by a plugin as raw samples). Default is mws. Address of server, required. Default is localhost. Specify the NAQS control/data port. Default is 28000. Name of the proc object (defined in streams.xml); used for processing raw streams (streams submitted by a plugin as raw samples). Default is naqs_bb40_sm100. NAQS (TCP/IP) with nmxptool. nmxptool is not part of SeisComP3 and needs to be installed under $INSTALLDIR/share/plugins/seedlink/. Hostname or IP of the NAQS server. Default is idahub.ucsd.edu. TCP port of the NAQS server. Default is 28000. Max latency in seconds (time to wait for missing packets). Default is 300. -1 is for Raw Stream, no Short-Term-Completion. Packets contain compressed data. 0 decompressed packets are received in chronological order without waiting for missing packets. [1..300] decompressed packets are received in chronological order but waiting for missing packets at most SECs seconds. This requires NaqsServer version greater than 1.90. Default is -1. Defines additional options passed to nmxptool. Hostname or IP of the NRTS server. Default is idahub.ucsd.edu. Port of the NRTS server. Default is 39136. List of streams to request. Default is bhz.00,bhn.00,bhe.00. Name of the proc object (defined in streams.xml); used for processing raw streams (streams submitted by a plugin as raw samples). Default is nrts. Hostname or IP of the Antelope ORB. Port of the Antelope ORB. Default is 39136. Source port to receive data packets. Default is 5330. UDP port. Default is auto. Hostname or IP of the RTPD server. Default is 127.0.0.1. Port of the RTPD server. Default is 2543. Defines an alternative unit mapping file. The default file is in $INSTALLDIR/var/lib/seedlink/reftek2sl.map. If this path is not an absolute path it will treated as relative path to $INSTALLDIR/var/lib/seedlink. The map file is used if the unit is not explictly given in the binding. Each line in the file is one mapping from a unit to a station name. The first column is the unit id e.g. 91F3 and the second column the Seedlink station name e.g. ABCD. The unit id. Default is 91F3. Name of the proc object (defined in streams.xml); used for processing raw streams (streams submitted by a plugin as raw samples). Default is reftek. Timeout length in seconds. If no data is received from a Reftek unit during this period, the plugin assumes that the unit is disconnected. Default is 60. Default timing quality in percents. This value will be used when no timing quality information is available. Can be -1 to omit the blockette 1001 altogether. Default is 40. Timing quality to use when GPS is out of lock. Default is 10. Send Reftek state-of-health data as Mini-SEED LOG stream. Default is true. Baud rate. Default is 38400. Use PC time for initial time setting. Default is 0. Name of the proc object (defined in streams.xml); used for processing raw streams (streams submitted by a plugin as raw samples). Default is sadc_100. SCREAM! server (TCP/UDP/IP) plugin that receives data via the SCREAM! protocol and sends raw data to Seedlink. The mapping from SCREAM! channel id's to Seedlink net.sta.loc.cha is defined in $INSTALLDIR/var/lib/seedlink/config/scream2sl.map if not specified otherwise (parameter 'map'). IP of the SCREAM! server. Default is 127.0.0.1. Port of the SCREAM! Default is 1567. Enables TCP/IP mode. By default the data is received via UDP but TCP is used instead. This needs a propert configuration of the SCREAM! server to accept TCP connections. Default is false. Defines an alternative stream mapping file. The default file is in $INSTALLDIR/var/lib/seedlink/scream2sl.map. If this path is not an absolute path it will treated as relative path to $INSTALLDIR/var/lib/seedlink. Defines the channel mappings (ID:channel, ...) from SCREAM! to the channel code used in streams.xml. If no channel mappings are given, the map file defined in map (either default or custom) is used. SCREAM! server plugin that receives data via the SCREAM! protocol and sends raw data to Seedlink. The mapping from SCREAM! channel id's to Seedlink net.sta.loc.cha is defined in $INSTALLDIR/var/lib/seedlink/config/scream2sl.map if not specified otherwise (parameter 'map'). This is the second revision of the scream plugin which supports buffering for short-term completeness. TCP port of the SCREAM! Default is 1567. UDP port of the SCREAM! Default is 1567. TCP port. Default is 502. Name of the proc object (defined in streams.xml); used for processing raw streams (streams submitted by a plugin as raw samples). Default is wago. Baud rate. Default is 57600. Name of the proc object (defined in streams.xml); used for processing raw streams (streams submitted by a plugin as raw samples). Default is wave24bb. UDP port to receive data packets. Default is 18000. Defines an alternative stream mapping file. The default file is in $INSTALLDIR/var/lib/seedlink/win2sl.map. If this path is not an absolute path it will treated as relative path to $INSTALLDIR/var/lib/seedlink. List of channels (hexID:name, ...). The name can either be a single channel name or a combination of station and channel separated by a whitespace, e.g. "ABCD BHZ". If no station name is given, e.g. only BHZ is specified, the name of the station the plugin bound to is used. The definition of a station name is important if the plugin configuration is used as a profile and assigned to multiple stations. In this case a mapping file would be the more appropriate solution. If no channel mappings are given, the map file defined in map (either default or custom) is used. Name of the proc object (defined in streams.xml); used for processing raw streams (streams submitted by a plugin as raw samples). Default is win. Release Seattle version 2014.084 © Copyright 2014, GFZ Potsdam, gempa GmbH.